I’m not a metal guy, but I do appreciate the band Babymetal, a J-pop/metal fusion that’s equal parts cute and dangerous. (If you want a taste of what the band’s about, I suggest you search for its signature song Gimme Chocolate!) I immediately thought of the members while playing Gal Metal, a quirky title that aims to have you save the world with the power of metal. While its unique approach to the rhythm game genre is something that could be a welcome addition to the Switch, the overall package leaves much to be desired. Gal Metal stars you, the drummer of an all-girl band, as they rock out. What’s missing from that sentence is the fact that you’re actually a boy who’s mysteriously inhabited the body of the drummer, and have to pretend to blend in with the rest of the members while groups of aliens try to take over the world. What transpires is relatively wacky, and the premise is one that is charming yet uniquely Japanese. However, while the main plot setup is fun, the execution of it is rather tame and uninspired. The core gameplay in Gal Metal revolves around using a pair of Joy-Con to bang rhythms together. While movements register as right and left hits, you can wave around your Joy-Con to hit things like snare drums and cymbals. It’s a freeform system that reminded me of Wii Music, but done in a way that’s more focused and entertaining. For one, you’ll be graded on the rhythms you crank out rather than achieving enlightenment (or whatever Wii Music’s goal was), and each song has a set point goal you need to reach. Playing further, it’s actually reminiscent of the recently released Taiko no Tatsujin, though it’s more on stringing moves together this time around. There are tons of different rhythm patterns you can master that are based off of real metal bands, though you’ll be drip fed them in story mode. Oddly enough, the songs aren’t licensed hard rock tracks or even Japanese-based ones, but metal adaptations of public domain tracks. 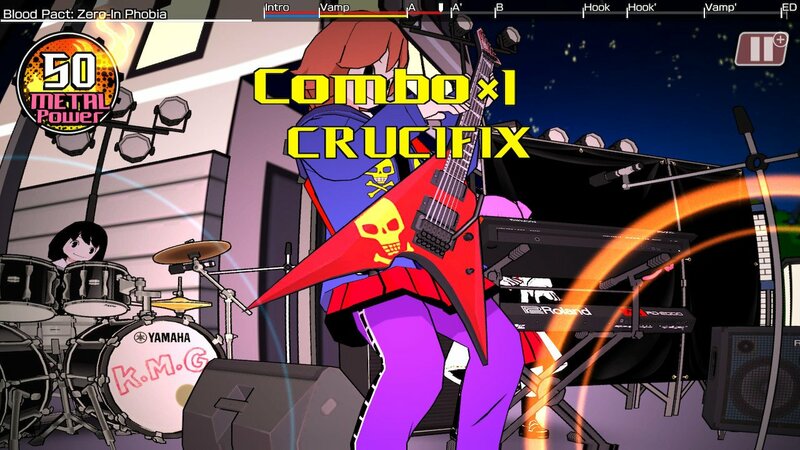 For what it’s worth, the music selection sounds pretty neat, and the metal remixes are pretty great to listen to on repeat playthroughs; you can replay songs in free play mode, which is vital if you want to try out new rhythms you find out later in the game. The gameplay does encourage creativity, but the motion detection is somewhat spotty. There were times when I felt off-sync even with calibration, and that caused my attempted move to turn into a low-scoring remnant, which happened more often than not. When the game works, it’s charming, but when it doesn’t, it feels like I’m just waggling around, unsure of what to do. Songs last around a couple minutes, so they’re not too unruly. If you want, you can also choose touch or button controls, which give the game a more conventional setup but also lose the originality that motion controls have; basically, it’s a sacrifice of style or substance, and each mode doesn’t feel like the definitive one. Of course, later songs will include some distractions from the opponent, such as ink splotches obscuring your view as well as disabling controls for a few moments. This means you’ll have to be on your guard at all times, though you’ll probably be fighting the controls anyways. Tying together the songs in story mode are two narrative parts: comic-book style cutscenes that occur before and after performances as well as bonding segments. 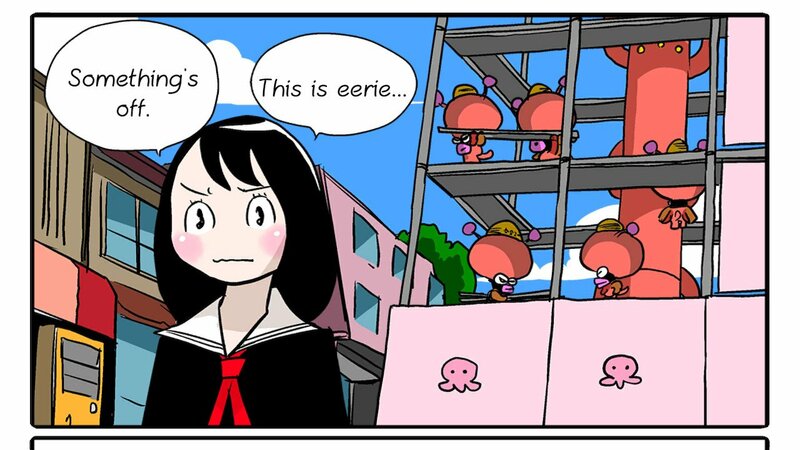 These comic book scenes are the bread and butter of the presentation of Gal Metal, and they’re very enjoyable to watch. It’s here that the zany nature of the game thrives, like how the band wants to go to a hot spring but the main male character feels very uncomfortable doing so; hilarity ensues. You also get a little more information about the aliens that are trying to conquer the world, and they’re adorable here. On the other hand, there are segments where you can build your friendships with the other band members. There are cell phone conversations that you’ll participate in with the members as they talk about their day-to-day shenanigans. Afterwards, using a bank of 40 heart points, you can hang out in different locations where the other band members may be spending time as well, and you’ll gain (or lose) parameter points for Morality, Guts, Activity, Passion, and Kvit, which help out with things like maintaining combos or powering through tricky parts of a song. These visual novel-esque segments feel like the bonding segments in games like Persona or Danganronpa, but unfortunately are voiceless. It doesn’t help that they feel one-note as well, with these cutscenes lacking any of the personality of the story-based segments. This part of the game feels like padding, which is even more apparent with the base songlist only containing a little over a dozen songs, though free DLC has recently been released with more on the way.